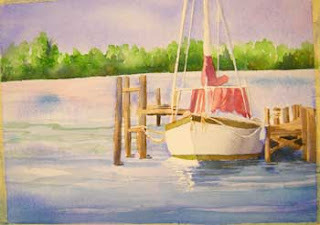 Today I am using the olive green mixture from yesterday and adding a touch of that color in the reflections of the boat in the water. These little brush strokes should be horizontal to maintain the appearance of the ripples in the water. I have also used a tiny bit of Quinicridone Gold and Burnt Sienna to make little angled strokes to the shadow side of the ropes. Danger! Don’t over work this. In the scheme of things in this painting, the ropes are not that important. Too much detail here will give them too much importance and make the painting look fussy and over-worked. I have used some VanDyke Brown to add a touch of shadow on the right sides of some of the dock posts, and as a glaze in the shadow areas under the dock. If you are in the Melbourne, Florida area, you can take one of my classes in person! Visit my website for details.